Dear Principal: Cancel That Honor Roll Assembly! Remember those bumper stickers that seemed all the rage in the nineties: “My son is an Honor Roll Student at Pleasant Valley Middle School?” Or, maybe you chuckled at the inappropriate bumper sticker that read: “My kid can beat up your honor roll student?” Or, perhaps you have seen posts on social media by proud parents displaying the fact that their kid made honor roll, or even high honor roll, or wait for it, the Principal’s High Honor Roll? You may have also read through the list of names on your child’s school websites, smiling with pride as your kid’s name is written there for the entire world-wide-web to witness? Parental pride, student pride, school-wide pride concerning students performing at a high level of achievement is not necessarily a negative thing. Many students work diligently and consistently to earn top marks. Many students enjoy the extrinsic motivation of holding that paper certificate every grading quarter. Grades matter in school–one of the few agreed-upon measures of student success. Grades, however, are less of a predictor of actual learning, growth, and effort. Also, many schools do not mathematically calculate how a student earns a place on the honor roll. For instance, at my children’s middle school a student must not have a class grade below an 80 percent. Therefore, even if a student earns a 93 percent average for the marking period, but has a 78 percent in math, that child is not “fit” for an honor roll award. Okay, you might say, so what? Who cares? It is just a piece of paper based on some criteria that do not represent what institutions of learning should value. I would agree. It doesn’t matter in the big scheme of things. So, why do schools across the nation, including the one that my children attend, make such a big deal about it? How come every quarter the entire fifth through eighth grades amass in the petite auditorium, to hear some of their peer’s called up on stage to receive their honor roll certificates? If honor roll attainment does not accurately show hard work and learning, why have an assembly? The result of quarterly honor roll assemblies is public shaming. Shaming of those kids who we all know will never have their names called. Those children will sit in their school’s auditorium every quarter for four years and never walk up those creaky wooden steps. Those seated students may have special needs, live in poverty causing them educational disadvantages, or not complete their assignments for a variety of reasons. Like the students on the stage, the seated students are not monolithic. Does their exclusion in this ceremony motivate them to work harder? Or do they give up? What purpose is the assembly, or honor roll for that matter, serving? This year, my children hear through the first year’s implementation of the Positivity Project that #otherpeoplematter, which I have previously written about in a post entitled: “Why is the Positivity Project Making My Kids So Negative.” I wonder does a public gathering of all students embody this hashtag? Does an honor roll assembly represent the values and the goal of the Positivity Project for which the district is invested? At the parent conference night, I observed many posters lining the halls promoting the idea that everyone matters, but the school leaders continue to perform the ritual shaming of honor roll assemblies every quarter. To give the school credit, this past quarter they did have the students wear their Positivity Project shirts and sit with other people who had the same top character trait. The result was that when students were called up to receive their honor roll certificates, they were seated in multi-grade-level groups instead of by class. Change is slow. My daughter in fifth-grade received her high honor roll certificate in the same room that my eighth-grade daughter was experiencing her first assembly where her name was absent (she was the numerical example above of a student earning a 93% average but not the distinction of honor roll). My oldest daughter who has been hardened by rejection, told me later: “I was fine. It doesn’t matter.” My youngest was happy to receive the certificate but felt uncomfortable on stage. In an attempt to build empathy, I used the day as a conversation about classmates who were left out. I also typed up a certificate for my oldest daughter and performed an honor roll ceremony in our kitchen. Although she claimed that she was okay with not being called, I knew she appreciated the gesture. We knew as a family that her math grade was due to her lack of math skills, which have not fully developed because she has never qualified for help, but she often needs extra practice. In addition, her math teacher counts assessments as 85 percent of the quarter grade. She can no longer coast on her homework work ethic in math class; she must finally learn the material. Unfortunately, students learn in a broken system. Honor roll assemblies shine a light on educational dysfunction. All students do not enter school with the same abilities or advantages, so success needs a new definition. Grades tell only a chapter of our students’ stories. Moreover, our students have plenty of examples of how they are “less than” others. Schools need to demonstrate appreciation for the diverse needs of all students, not continue to celebrate the few and the fortunate. We have a lot of the opposite problem where I am. Kids who are consistently getting great grades, not getting into trouble, etc., are made to sit in study halls while kids who “need to burn excess energy” or “are getting rewarded for not having a behavior that day” get to go play basketball or do other fun activities. Kids see this and think “why am I getting punished for doing everything right?” We need to recognize both improvement AND continual hard work and dedication. I don’t think assemblies are the way to go, though, or these quarterly parties that the kids on the honor roll or no tardy list get. That’s once per quarter, not daily or even weekly. I don’t have a solution, but I also don’t believe you shouldn’t recognize a problem until you have one. Maybe someone else will have a solution if you are willing to bring up the question! Acknowledging achievement shouldn’t be viewed negatively. Sitting in a PTO meeting at any school will introduce you to the parents of your honor roll kids. Parent involvement in a child’s education is the greatest predictor of student success that a family can control. 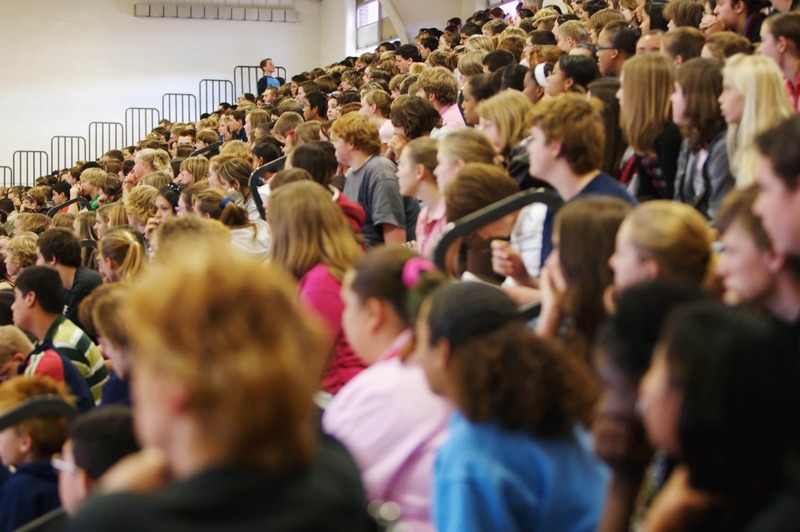 Honor roll assemblies aren’t the problem. Address poverty, parental involvement, and funding tied to assessments, then you’ll see change.